Having four kids makes me part of a special club. For example the other night, at my kids' elementary school, I met some other moms. We instantly started asking the how many kids do you have question. The mom across from me said the magic number, four. Instant connection and we forgot the other moms were there. Mom-of-four and I bonded over all the funny looks we get, how people asked us "why" when we were pregnant with the fourth and more. We also discussed how much we really love our kids and enjoy them. There was talk about how we never volunteer for things because of the other kids, run a little bit late to everything and how strange it was to be pregnant or nursing for almost an entire decade. "We gotta stick together, us moms of four," she smiled and looked like she was going to give me a fist bump. But she leaned in closer and said, "I mean we have a lot of kids, but can you imagine five?" After a good giggle about how people that have five kids are nuts we said our good-byes, telling each other to have a good year since neither one of us will be volunteering in the classroom. 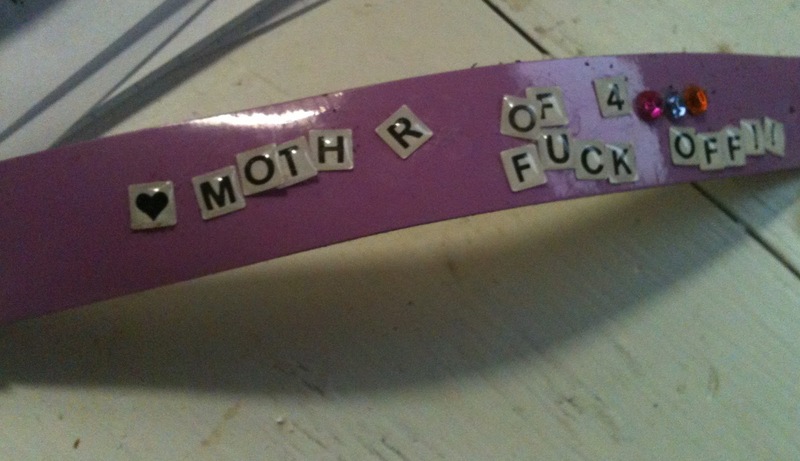 This is a bracelet my pal Stephanie made for me in the weeks right after having my fourth baby. Even though she only has two kids, I made her an honorary member of the club, because she gets it. And yes, I think it is funnier now that the "e" has fallen out of mother. And no, I don't wear this in front of my kids, only PTA meetings. Just kidding, I don't go to those. "Three Is The New Two," exclaimed a headline from an article I read online. And there was a story on the "Today" show about how cool it was to have three kids. Back in 2006, I was feeling pretty cutting edge and with it as I watched Matt Lauer talk to the child psychologist and parenting expert. My third baby was on my hip while I was getting breakfast ready for my other two--I was happy and possibly trendy for the first time in my life. But then we decided to have another baby. Three kids people can wrap their head around, but four changes everything. We always wanted four kids. When Tim and I were engaged I would stare dreamily at the newly popular SUVs imagining our rowdy brood riding around town in one. You see Tim and I are dreamers. Ever since we first met, we have talked about what our future will look like. We dreamed of a farmhouse, but not too "farmy" (per my request). We dreamed about years of babies and toddlers. We dreamed about having a couple of dogs, labs or golden retrievers. The first time we talked about maybe having a fourth baby, I did what I think most people would do, I googled "families with four children." Isn't that what you would do? Oh, you might look at your finances, house size, career goals? I said we were dreamers, not planners. So I googled and dreamed. And I swear to you during that time period on TLC there were all these shows about ultra large families. Families with 17 children and they all seemed happy. I reasoned that if they can be happy with all those kids in an A-frame house in northern Minnesota, I can handle four in a Detroit suburb. And then there was Diane Keaton and the rest of the cast that influenced my decision. My husband Tim and I love the movie "The Family Stone." It is a movie about a family with five adult children that come home for Christmas. The movie is kind of sad because the mom dies (sorry if I spoiled the ending, still worth watching if you haven't seen it). But the feel good chaos of the fake family appealed to us. See, we do chaos really well. The everyday details of life management, still working on that. But we always make it work. It is interesting to watch the four kids pair off. It is always changing. And our chaotic larger-than-in-fashion family is happily making it work. That's right we are using Brainy Smurf in Dora CandyLand, along with a headless action figure and a diary lock, as our "guys." Just another example of how we are making it work. As I dreamed about having four kids in my SUV I had no idea what it all meant. To be honest, I am still wrapping my head around it all. Tim once said parenting this many children is like playing Whac-A-Mole. Just when you think you've pounded all those problems down, another one pops up. But I do know that my house is always full of noise and I love it. My kids don't get everything they want and they already know that life just sometimes isn't fair. They play together and make up games (or melt army men with blowtorches). Boredom doesn't exist in my house. Because if they are bored, there is always some one to fight with or mess with. And they do fight, but they also defend each other and love each other. The kids are bonding over how to demolish this toy truck. Destruction of property brings my kids together. And keeps them quiet and busy for at least 15 minutes. And our small house? Can you believe they all want to share a room? I know there are changes in store. Now I dream of happy, well-adjusted teenagers that play in the band and run track. Because from what I remember from high school, all those people in the band always seemed so happy and not on drugs. And people that ran track didn't get concussions. But whatever happens, we'll make it work and I can bet you it's not going to be boring. ahhh I remember the days fondly of 4 kids. I remember people thought we were nuts and we didn't get invited many places. It always felt like we brought our own personal circus wherever we went. We're up to 6 kids now and I think we're done! They're 14, 13, 12, 8, 4,and 3. Thank you for your candid post. It made me smile.